One of my friends describes cities as if they were his girlfriends. He says New York is the city he loves and wants to be with, but isn't sure would be good for him. He loves Denver and is having a good time here now, but isn't sure whether he wants to commit for the long term. If cities are people, then Seattle is my ex-boyfriend. Whenever I go back to Seattle, I feel like I'm going back to my ex. Seattle is comfortable and familiar. It greets me with sunny skies, amazing lattes, fresh seafood, delicious produce from the market, a beautiful skyline. I only remember the good parts. But the longer I'm there, the more I realize why I left. It's rainy and cloudy. It never gets very warm. It's passive aggressive. And while there are things I love about Seattle, there are things that never quite fit or feel right. During the "I-love-Seattle-why-did-I-ever-leave" phase of my visit last week, walked to Pike Place Market on a perfect, sunny Seattle afternoon. I explored the rows of fresh berries, veggies and peaches. I bought berries to snack on, flowers for the friends I stayed with and some other things I knew would make it back to Denver in my carry-on suitcase. Then I saw what I really wanted. Piles and piles of basil. 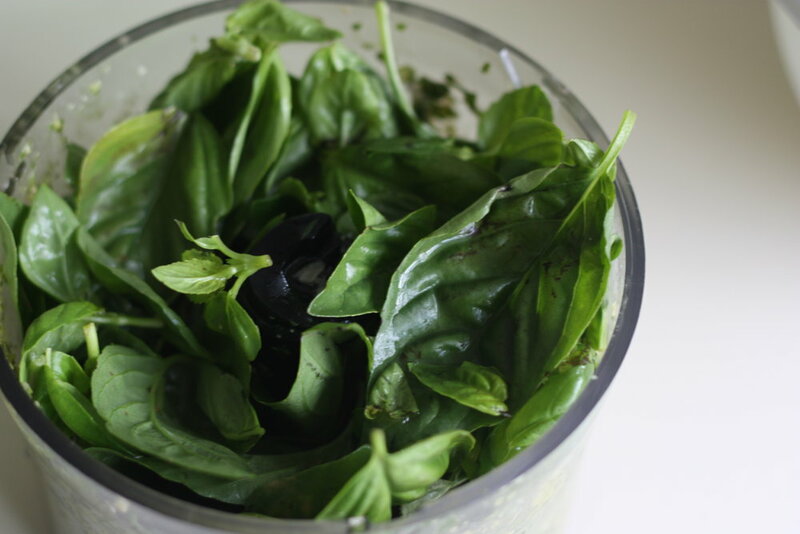 Fresh basil. Basil that you can smell from 10 yards away. Basil with the roots still attached. I paid $2 for a huge amount of basil that might have cost me $20 in Denver. And I figured that if it arrived back in Denver wilted and unusable, at least I tried. Fortunately for me, it (mostly) survived the journey in my laptop bag. I knew it wouldn't last much longer before wilting, so what to do with tons and tons of fresh basil? 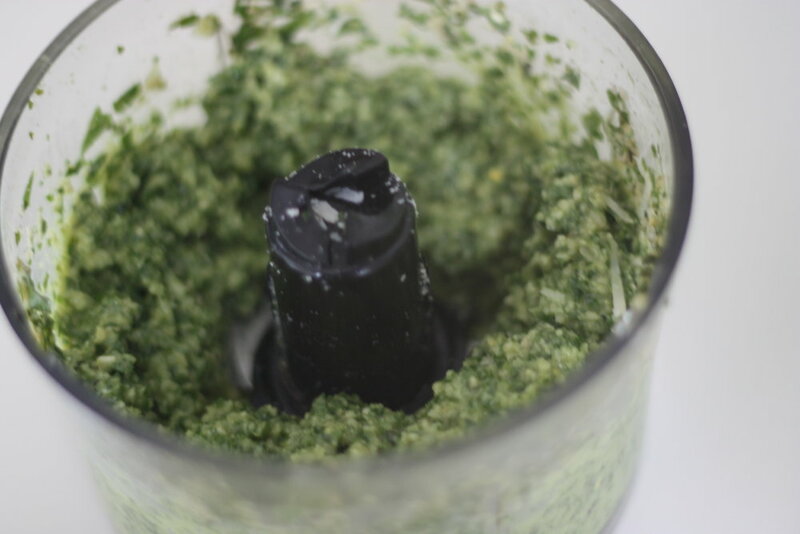 Make pesto of course! 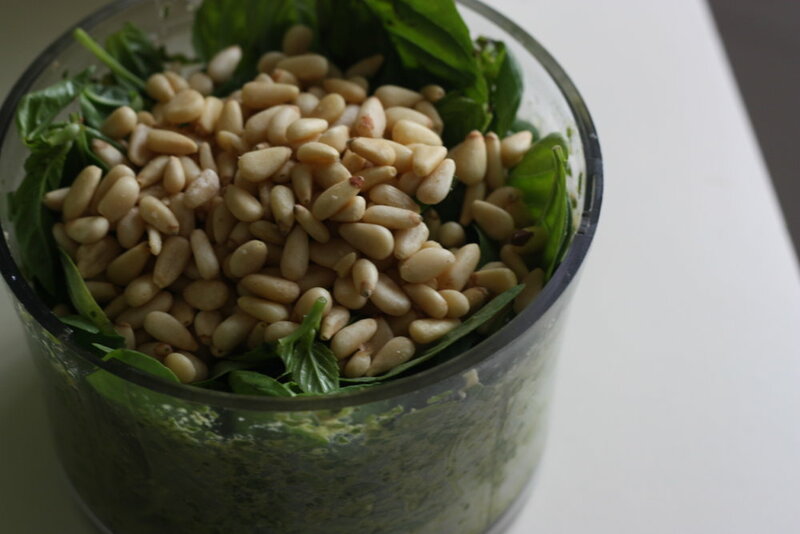 Combine basil and pine nuts in a food processor and pulse a few times to combine. Add garlic and pulse a few times. Add in olive oil and mix together. Add in the grated cheese and mix until all the ingredients are blended together. My fling with Seattle and its food, cool weather, beautiful views, ferry rides, lattes and hipsters is over for now. I'm happy to be back in Denver. But that doesn't mean I won't be planning my culinary delights for my next visit to the Pacific Northwest!